The biggest show in UFC history took place this past week. Look at the economics, the lessons, what it says about the fan base, the promotion and the regulators in how things escalated into the brawl that took place. Examine how Conor McGregor benefited from the brawl, likelihood of a rematch, as well as all the changes in upcoming cards and the making jokes out of the various championships. There is also the regular coverage of UFC 229 with a look at the matches and poll results. This issue addresses the next two major WWE shows, Evolution and Crown Jewel. Look at the issues facing WWE and Saudi Arabia, why the issues are so much deeper than women not being allowed to perform, and the return of Shawn Michaels. Read more on Rey Mysterio's return to WWE, Smackdown 1,000, who is coming to Smackdown 1,000, Kevin Owens injury update, why WWE stock declined so much this past week, notes on potential of ratings on FOX and how that compares to FOX's usual Friday numbers. This issue has more on the life and career of Hiroshi Wajima, a former All Japan headliner who was one of the greatest sumos of all-time. TMZ interviewed Randy Orton and asked how he feels about WWE going to Saudi Arabia for Crown Jewel. His defense was similar to the one JBL gave on Fox Business. "I think we should go. I think the only way to help with change over there is to go and not to cancel the trip,” Orton said. "That's the goal is to make things better everywhere and I think us not going doesn't help. Going helps." Like JBL, Orton brought up WWE having a women’s match in Abu Dhabi. Orton said "100 percent" when he was asked if he thinks they’ll be able to have a women’s match in Saudi Arabia at some point. NXT is taping television at Full Sail University tonight. MJ Jenkins posted a picture from the tapings that included Chelsea Green. On the NXT episode that is airing on the WWE Network tonight, Nikki Cross faces Bianca Belair, War Raiders challenge for Kyle O’Reilly & Roderick Strong’s Tag Team titles, Shayna Baszler takes on Britt Baker, and Oney Lorcan teams with Danny Burch against Tian Bing & Rocky. The quarterfinals are airing on this week’s Mae Young Classic episode. The four matches for the show are: Mia Yim vs. Toni Storm, Tegan Nox vs. Rhea Ripley, Io Shirai vs. Deonna Purrazzo, and Meiko Satomura vs. Lacey Lane. Though he wasn’t on the episode, James Ellsworth was at SmackDown 1000 and appeared in a post-show video where he said he should have been on the show but Paige told him he was fired. Becky Lynch retained her title against Charlotte Flair in a dark match after last night’s Mixed Match Challenge. Rey Mysterio challenging for Shinsuke Nakamura’s United States Championship is now listed for the Starrcade house show in Cincinnati, Ohio on November 24. Rusev was originally advertised as Nakamura’s opponent. PWInsider reported that Ivory and Molly Holly are scheduled to be at WWE’s Evolution PPV. Shane McMahon, who made an appearance on SmackDown 1000 last night, was the guest on the latest episode of the Opie Radio podcast. PWInsider reported that Impact Wrestling and Sami Callihan have come to terms on a new deal. They also noted that the word going around at last night’s tapings was that Jordynne Grace has signed a two-year deal with Impact. Beer City Bruiser, Silas Young, and Luchasaurus have been announced for ROH’s Survival of the Fittest tournament. The other wrestlers who have been confirmed thus far are: Tracy Williams, Marty Scurll, Andrew Everett, Jonathan Gresham, Flip Gordon, Colin Delaney, PJ Black, and Hangman Page. Ilja Dragunov will be wrestling at PROGRESS’ show in Manchester, England on November 11. The final episode of Ten Pounds of Gold before the NWA’s 70th Anniversary Show finished building to Cody Rhodes and Nick Aldis’ rematch. The Tennessean ran an article on the NWA anniversary event. 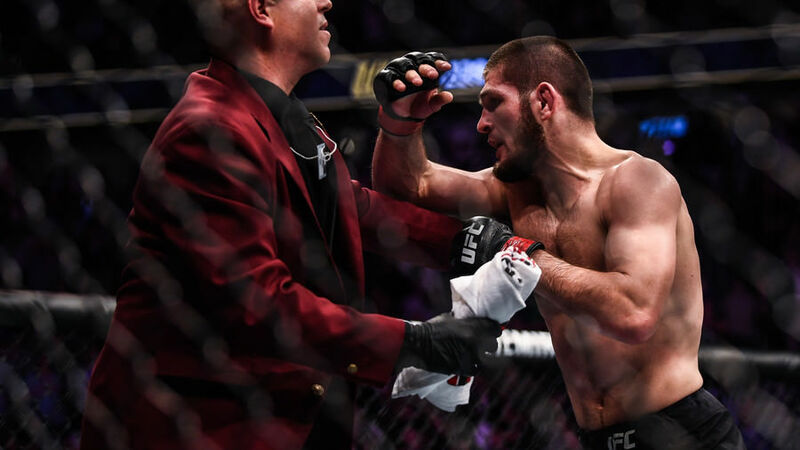 Floyd Mayweather criticized Nurmagomedov for his actions at UFC 229. Boxer Canelo Alvarez has signed a five-year, 11-fight contract with DAZN (which is the new home of Golden Boy Boxing) that’s worth a minimum of $365 million. Ariel Helwani reported that Greg Hardy’s next fight will be for Island Fights in Pensacola, Florida on December 21. Helwani noted that he was told that if all goes well, Hardy’s next fight after that will be in the UFC. Artem Lobov vs. Michael Johnson is official for the UFC’s Fight Night show in Moncton, New Brunswick, Canada on October 27. Lobov was originally supposed to face Zubaira Tukhugov before Tukhugov’s involvement in the UFC 229 melee. Cat Zingano vs. Megan Anderson is also official for UFC 232 in Las Vegas on December 29. Daniel Cormier vs. Derrick Lewis and Luke Rockhold vs. Chris Weidman are featured on the poster for UFC 230.